As a birthday treat, I spent last weekend at Portmeirion . I have visited the place before for the annual lunch of Academi, the organisation for writers in Wales and for the the launch of R.S. Thomas’ recording of himself reading his poetry in a 3-cd set from Sain which was held there when the poet was living in a cottage on the estate. The village’s current connection with the literary world stems from the fact that it is managed by Robin Llewelyn, a Welsh-language novelist and winner of a National Eisteddfod prose medal. He is also the grandson of Clough Williams-Ellis, the architect who built this extraordinary place between the 1920’s and the 1960’s. It is often referred to as an Italianate village. But this doesn’t go even half-way to describing it. The collection of different structures, all painted in bright colours, ranges from Italianate villas, cottages, pseudo-churches with towers or domes, classical colonnades, statues, ponds, follies and alcoves containing all manner of things. The whole place occupies a narrow valley running steeply down to the sea and looks across an inlet near the town of Porthmadog in Snowdonia. How does one assess such a place? It is possible to view it as nothing more than a high class theme park created by a romantic eccentric whose time-scale was predominantly ‘retro’. The judgement of Jan Morris, a neighbour of the architect, is that “His early work was recognisably of the Arts and Crafts Movement [but] ended with tentative essays in 1930’s modernism”. It is easy to forget that, in spite of his country squire image (he habitually wore corduroy breeches tucked into yellow stockings and extravagant bow ties), he was quite forward looking on issues such as conservation and the need to regulate urban development. 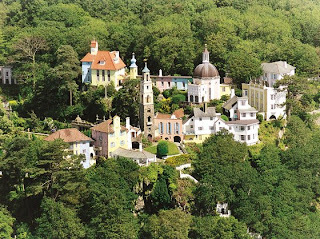 In its early years Portmeirion was a resort of the intelligentsia that Clough Williams-Ellis and his wife Amabel Strachey moved among. But by the 1950’s the public were also being invited in and it grew as a popular tourist destination after the TV series ‘The Prisoner’ was filmed there in the 1960’s. Nowadays it is at night, when the coach parties have gone, that those staying in the village can relish the trafficless calm of the place and the subtly lit shapes of colonnades, cupolas and towers as ghostly presences in the dark. Statues watch over you as you make your way to the hotel for dinner and the wash of the waves on the hotel terrace are a soothing backdrop to your arrival there. During the day it is possible to escape the crowds by exploring the miles of paths through the surrounding woodlands, themselves containing gazebos, grottoes and swampy hollows full of writhing boughs and twisted branches. Delightful! A phenblwydd hapus i ti!